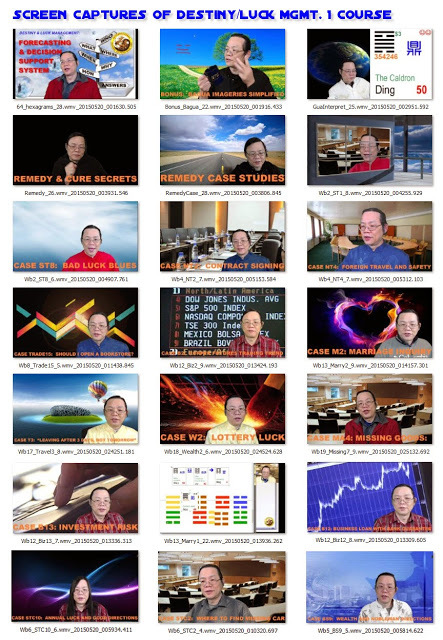 This is my latest video correspondence course with 32 hours of HD video. It helps people to make decisions and problem-solving under any conditions-- whether it is well-structured, fuzzy or ambiguous and with or without input from the sources. It provides guidance and decision-making advice for you, especially when you are at a critical or helpless situation. This course may turn you into a psychic even if you have no psychic ability. This course is part of the "Destiny and Luck Management" (DLM) series which aims at applying Chinese metaphysics into real life situations. It may work in conjunction with the "Bazi Therapy and Enhancement" courses or work alone by itself. Unlike the DLM- Bazi enhancement courses, this course does not have any special prerequisite to enter and is "idiot-proof"-- you are guaranteed to use this course within 5 minutes if you can read and flip a book. However, if you want to take advantage of all the "bells and whistles" of this course, you need to study it (especially the case studies) for 2 to 4 weeks. This course comes with over 32 hours of compressed video (professional version). All videos are menu-driven (on Windows-based PC) and interactive (see below for DVD menu screens). Extensive references materials and cheat sheets are provided for rapid learning/ operation. It will take at least 10 days if this course is taught in live seminar and costs US$5000 in tuition alone. It is also impossible to cover 200 case studies in a live seminar too. This course does not intend to make major changes in your destiny but rather to make your destiny more manageable by making gradual small changes in your life. Small changes are easier to make than drastically changing your fate. But enough “small changes” can affect major changes gradually. Two other courses of this series--“Bazi Therapy and Enhancements” work on your 4-Pillars and Feng Shui levels to change destiny. You need birth data to do it. The beauty of this course is that it works on results from the Destiny Forecasting Method with or without input from the parties involved. You can indeed generate rich info from the universe out of nothing as if you have a direct line to God. This is the closest alternative for one working like a psychic but without the actual psychic ability. This course contains two sections. 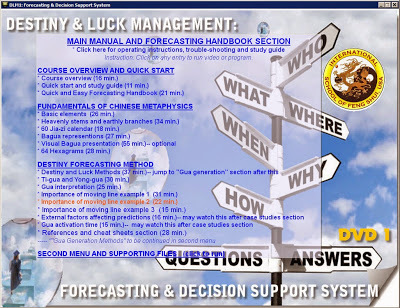 The first section is on how to make predictions based on your questions. This means learning how to operate the Destiny Forecasting Method. The second part is the case studies sections. Many techniques are difficult to teach except through case studies like studying legal cases in law schools. 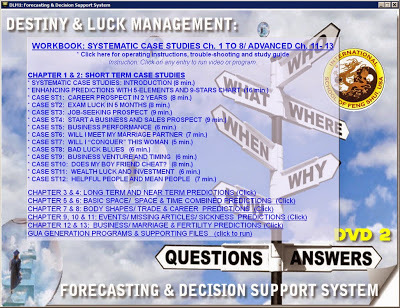 SYSTEMATIC CASE STUDIES (in both Professional and standard versions): There are about 100 "systematic" case studies which are easy to learn and apply in real life situations. It starts from simple predictions to complicated ones which integrate time, space, personal characteristics and simple Feng Shui. 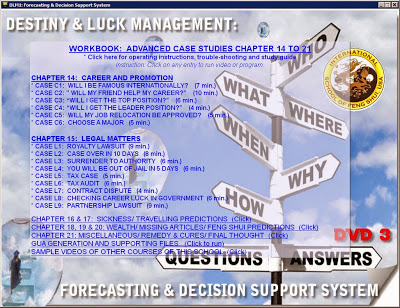 ADVANCED CASE STUDIES (in Professional version only): There are another 100 case studies taken from the files of several masters. These case studies utilize a variety of methods and techniques to extract rich contextual information from virtually nothing or even with no input from the targets. Do you want to know your current courtship will lead to? Do you want to know the auspiciousness of the house that you are going to buy? Do you want to know your partner is helpful to you (your “nobleman”)? Do you want to know why your business suddenly drops? Do you want to know if you should invest on this business venture? Do you want to know if you can collect your debt from your debtors? Do you want to know if the coming trip is good for you? Do you want to know if your current Feng Shui affects your luck? Will you or your son do well in that important exam or interview? Where will you find your helpful people? What type of business should you do? What will be the result of your legal lawsuit? What is your competition strategy towards you? Best of all, you do not need input from other party to use Destiny Forecasting Method. No birth data is needed. This course will show you a simple method to answer your “want to know” questions and show you how to enhance the effects of an event, reduce the effects of an event and prevent or delay the occurrence of an event. It does NOT mean to change your destiny, but makes your destiny more predictable and manageable. It is especially useful when you are at the crossroad of life by providing "temporary relief" or "breathing time". NOTE: Some of the cures and remedies in this course are temporary or "emergency assistance" that may last a few weeks to months only. Both versions are identical except the pro version has 100 more case studies.